Whether you have back to school supplies, birthday presents, or unexpected medical expenses to pay for, chances are you will need some quick, easy cash at some point in your life. Use one or a few of these five great ways to earn some quick cash instead. Take online surveys for cash and rewards from the comfort of your own home. I like using my rewards from surveys for birthday and Christmas presents. Try Survey Junkie. I’ve been a member of Swagbucks for several years now and have a lifetime earnings of almost 85,000 Swagbucks! I use Swagbucks to earn Amazon Gift Cards to pay for a lot of things we need including household supplies and more! I check Ibotta on a weekly basis to see what we can earn back on our grocery purchases! I’ve earned about $250+ lifetime earnings with Ibotta. If you like Ibotta, chances are, you’ll like Checkout 51, too! If you like to shop online at your favorite retailers, check out Ebates and earn cash back on your purchases! Join Inbox Dollars right now and you’ll earn $5 in your account just for joining! Then, you can do things like read emails, take a few surveys, play games, or shop to earn more. Once you reach $30 in your account, you can request payment! Do you have extra furniture, clothes, toys, collectibles or other home items lying around your home that you don’t want or need anymore? Sell them in a garage sale, to a consignment shop, or on Ebay. Not only will you declutter your home and help someone who needs those items, but you’ll make some quick, easy money too! Babysitting, pet sitting and house sitting are all great ways to make some quick, easy money without too much work. Depending on the arrangement, you could work from your home or theirs, full time or part time, once in a while or on a consistent schedule. This option is especially great for stay-at-home moms who are home all day anyway. All of these ideas are super easy to do, and there is no wait time to find a job or get paid. 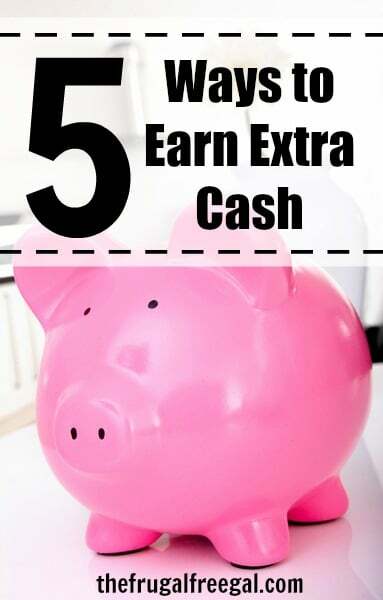 What ways do you like to earn extra cash? When I needed quick cash I would take clothing, shoes or purses to a consignment shop that pays right away. This is a great option, too!